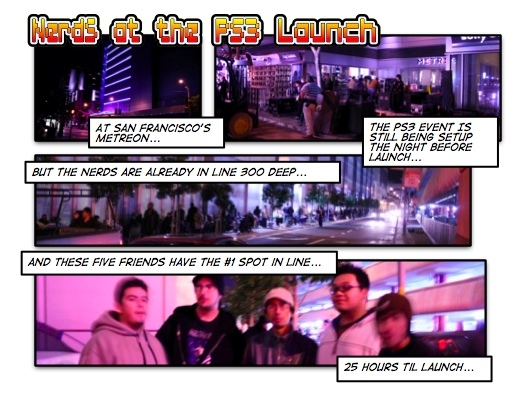 It's 11PM, 25 hours til the PS3 goes on sale in SF, and there's already a line of 300 people at Sony's Metreon mall. At the front of the line, I find five friends and their tent: Chris, Preston, John, Edgar, and Gieson. They'd been there since 8am, which means they'll have been in their line for... a total of 40 hours when they get their PS3s. The funny thing is, when I asked the guys which console they were more excited about, PS3 or Wii, all five said, with great enthusiasm, "Wii!" And they plan on camping out this weekend for that launch, too.